World Translation Center can provide professional Armenian translation services for English to Armenian and Armenian to English. We can also translate Armenian to and from over 150 other languages, including all the principal languages of Europe, Asia, South America, the Middle East and a wide range of African languages, at competitive prices. Our Armenian specialists will be able to provide translation for virtually any project you might have, including marketing materials, technical, financial, legal and medical documents, websites and software. Our skilled project managers will match your project with a translator team best suited for the area of expertise needed. Every linguist works exclusively in his or her own mother tongue and within his or her area of expertise guaranteeing not only quality translation, but proper localization as well. After each document is translated, it will be edited and proofread by another professional translator to assure maximum quality. We also make available transcription, video recording and subtitling services. In the event that you need to have an existing video dubbed, a commercial narrated or a telephone system recorded, our native Armenian speakers are available to provide high quality voiceover services. Armenian is an Indo-European language spoken in the Republic of Armenia and also in other locations such as the republics of former Soviet Union, The Balkans, Middle East, and the United States of America. 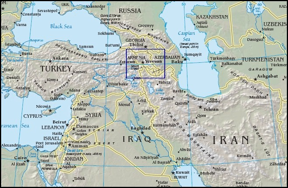 Eastern Armenian is the official language and the only language used in-country. Western Armenian applies to diaspora Armenian communities in North and South America, Europe and the Middle East (with the exception of Iran). There are differences in pronunciation, grammar, orthography, and vocabulary. 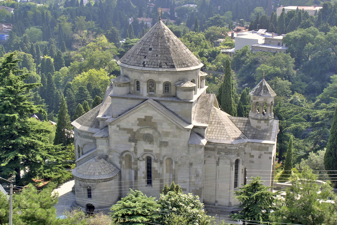 It was developed in the early part of the 19th century, and is based on the Armenian dialect of Istanbul. Western Armenian has six nominal cases: Nominative (subject), Accusative (direct object), Genitive (possession), Dative (indirect object), Ablative (origin) and Instrumental (means). Like in Eastern Armenian, nouns in Western Armenian decline for number (singular and plural), but do not decline for gender (i.e. masculine or feminine). Armenian was originally split into two primary dialects: Eastern Armenian, the actual spoken form in current Armenia, and Western Armenian, the form spoken by Armenians in Anatolia. After the Armenian Genocide, the western form was spoken mainly by the diaspora group. Modern Armenian dates back to the 16th century and is used both in formal written texts, as well as in everyday conversation. The first records of written Armenian date from early 5th century AD, but this type of Armenian, which differed from the spoken one, has more of an archaic or classical style, and is used primarily by the Armenian Church. 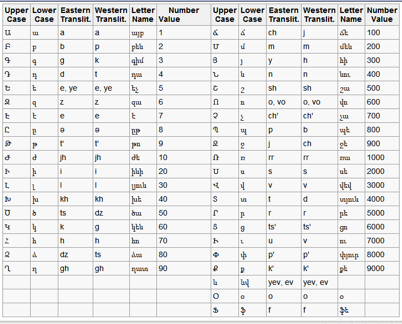 Armenian is written in the Armenian Alphabet, shown below. It is based on the Greek alphabet, with some additional letters from different sources to represent sounds that do not occur in Greek. One interesting characteristic of this alphabet is that most of the letters have numerical values.